You are currently browsing the category archive for the ‘making Mondays good’ category. I stopped and looked at the gorgeous morning of a new work week. It was Monday and my responsibilities were piled high in my computer inbox. But, I stacked the deck in my favor before the diligent work began. First, I hopped on my bicycle and wheeled through my neighborhood. The temperatures at 630AM are welcoming and pleasant. Meteorologists predicted that the warmer weather would grip our city with 100 degrees in a matter of hours. Right now just as the sun is climbing its perch to scorch our city, I was taking in the 71 degrees and allowing my legs to burn off some energy and get my blood circulating freely. My lungs were inviting me to stretch their capacity. Keeping ahead of all of the physical limits was my smoothly beating heart. Houston never allows a July morning to be anything but predictable. Humidity was stripping away the ease to breathe and feel cool. Sticky weather was starting to fill up every cubic foot of air space. Sweat was pouring down my face. It dripped off of my chin soaking my helmet strap. A good spot lay ahead and I paused to rehydrate. Now, the sun was making its grand appearance. It was a welcome sight this early in the morning. The quiet pool reflected the light and enhanced the beauty of trees, shadows and puddles in the pond made by hungry fish looking for breakfast. Tranquility and peace marked this stop. Cool water reinvigorated my tired body. But, this was home, my neighborhood. A smile crept across my face. For a brief moment, although surrounded by thousands of neighbors and even more commuters getting ready to flood the streets, I was alone. Serenity was mine to claim and I was relishing in the thrill. I climbed aboard my road bike, wiped the sweat from my brow, checked my time and knew that I could easily make it home for a shower and then the commute to the office. 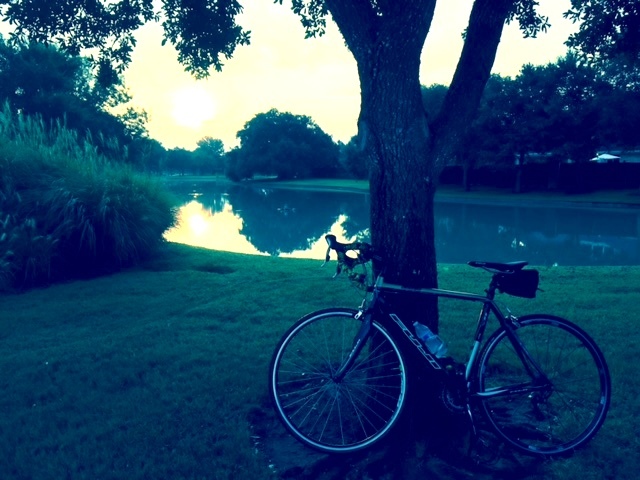 God had reminded me that when I take a moment to reflect a His good Word that I had read before my ride, let Him hear my personal worship on the road and relished in what He would privilege me in doing in the hours ahead, then the day, even a Monday, was going to be a grand day. Do you like Mondays?